Green beans have long, slender edible pods and are also called string or snap beans. Wax beans, another type of snap bean, are similar in flavor to green beans and named for their pale yellow color. 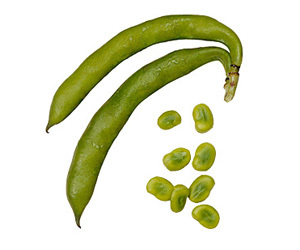 Available nearly year-round in supermarkets, the peak season for fresh green and wax beans is May through September. Enjoy this versatile vegetable as a side dish or part of a main-dish meal in salads, soups, stews, stir-fries and casseroles. Select brightly colored, unblemished green and wax beans with smooth pods that are crisp enough to snap when bent in half. Slender pods indicate tenderness. Refrigerate unwashed beans in a perforated plastic bag for up to 5 days. For maximum crispness, it’s best to use the beans within 2 days of purchase. Wash the beans, then snap off and discard the stem ends, pulling any strings down along the length of the beans. Break the beans into desired lengths or leave whole. Or, cut them French-style by slicing lengthwise into halves or quarters. Steam, boil, microwave or stir-fry fresh beans until crisp-tender. For best results, use a pot or dish large enough to avoid overcrowding the beans during cooking. Do not overcook or they will lose their vibrant color and fresh flavor. Green beans will turn a drab color when cooked or tossed with acidic ingredients, such as tomatoes, lemon juice and vinaigrettes. If possible, add these ingredients near the end of the cooking time or close to the serving time to retain a bright green color. Fresh green beans provide a good source of vitamin C and fiber, and are low in calories, fat and sodium. Serve whole raw or blanched beans with your favorite KRAFT Dressing as a dip. Garnish cooked beans with a sprinkle of toasted chopped PLANTERS Walnuts or Sliced Almonds for extra flavor and crunch. Make cooked beans irresistible to kids by pouring warm CHEEZ WHIZ Cheese Sauce over them before serving. Add beans to your favorite stir-fry recipe for great color and flavor. Jazz up your favorite potato salad recipe by stirring in cooked green beans. Toss cooked beans with basil pesto sauce for a side dish with zesty Italian flavor.